Casa Lazira is a pleasant and spacious apartment which faces the sun and the sea. It sleeps six people. From Casa Lazira you will enjoy a fascinating view of the sea, of Amalfi and the coast of Amalfi. Casa Lazira is 90 square meters (970 square feet). It features a wide private terrace with a view of the sea, air conditioning (please read description below to check in which rooms the units are installed) and winter heating. You will be at a short distance from the center of Amalfi, where you will find restaurants, shops, public transportation, the beach and the tourist port. You will find the stop for the SITA bus Amalfi - Sorrento line at 200 meters (660 feet) and the closest beach at 300 meters (approximately 990 feet). Casa Lazira is located on the fourth floor of an ancient building. You will reach it from the street level going up a 150-meters (490-feet) public walkway that includes approximately 220 stairway steps. You will not need a car to stay at Casa Lazira. If you do have one, you will be able to park it for a fee, in a public parking lot (being the lot a public one, parking spaces can not be reserved). The terrace is 80 square meters (860 square feet) large. It is equipped with a table, chairs, a swing and hammocks. Here you will also find a portable barbecue. 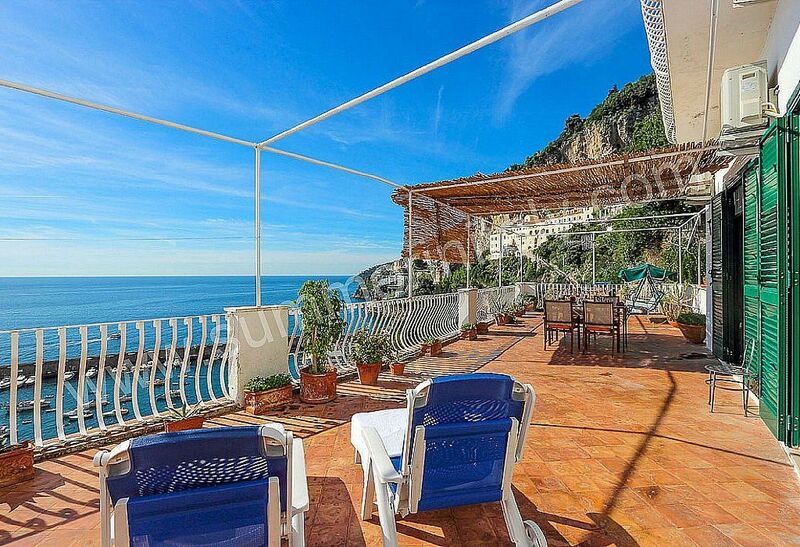 From the terrace you will enjoy a wonderful view of the sea, of Amalfi and the coast of Amalfi. The living room is paved with handmade majolica tiles, in the characteristic style of the Amalfi Coast. The furnishings are cozy and comfortable, and include some antique pieces. The furnishings include a sofa and a divan that unfolds into a double bed. There is a big fireplace. In the living room you will also find a cooking area. The kitchenette is equipped with a four-burner gas cooker, an electric oven, a refrigerator with freezer, an Italian-style coffee-maker and a kettle. There is also a washing machine, an iron and an ironing board. The dining table can accommodate six guests. In this room you will find a flat-screen television (local channels). From the living room you will be able to enter the terrace with a view of the sea and of the coast of Amalfi through two French doors. The room has a window with a partial view of the sea. It is equipped with an air conditioning/heating unit. You will be able to enter the first bedroom from the living room. The bedroom has a matrimonial bed (160 cm/62 inches, wider than a queen-size bed). The furnishings include a desk. The room has a window with a partial view of the sea. The bedroom is equipped with an air conditioning/heating unit. This bedroom has an en-suite bathroom, equipped with a washbasin, a toilet, a bathtub with shower wand and a hairdryer. You will be able to enter the second bedroom from the corridor. The bedroom has a matrimonial bed (160 cm/62 inches, wider than a queen-size bed). From the bedroom you will be able to enter the terrace with a view of the sea and of the coast of Amalfi through a French door. The bedroom is equipped with an air conditioning/heating unit. Very nice place, perfectly clean, great terrace! The property matched the description. The welcome blast of air conditioning and the view incredible over Amalfi marina and the adjacent properties. The bedrooms were basic, but lack of any drawer space meant suitcases were needed to be used throughout the stay. The shower was very small. Wi-Fi was efficient and fast, air conditioning was efficient. Luca Trotta and his team were very efficient from the outset and were available prior to the holiday to answer any queries we had. This was done most promptly. The young guy who met us at the apartment was very friendly and was easy to contact if needed during the week of our stay. Very impressed with Summer In Italy. Very helpful when I bombarded the staff with queries the week before we left. Always received their reply within 24 hours or less. I am researching and starting to plan our next walking holiday in Italy for 2018 and will be using Summer In Italy again. Thanks Luca and all your staff for a fab holiday! The best terrace in Amalfi. Great location even if there are a lot of stairs to climb. The apartment is nice and clean and we hope to return some day. Good service all the time from Summer In Italy. Good info and really good connection. Casa Lazira was everything you could possibly want for a holiday. My husband and I went there with our son and his wife and there were ample rooms for all the four adults. There is also a spacious terrace with spectacular views. The caretaker was really friendly and helpful. We enjoyed Casa Lazira so much and are already planning to go back there in the future. The fact that there are so many steps to get to the apartment won't put us off going there again. We are so pleased we booked through Summer In Italy. You were very helpful all the time, from booking to holiday itself. We couldn't ask for a better service and would certainly book through you again. Thank you. A brilliant apartment with a superb terrace. Lots of steps to get there but always worth the effort. The rental price includes: electricity; linens; towels.Available upon request: baby bed. To be paid at the property:final cleaning EUR 130.00.